I've made zines in one form or another with my friends since high school. Actually, in the beginning, I had no clue there was a name for them. It started when I thought to collect my poems and art, make photocopies, and hand 'em out to other kids. I was shy, but somehow came up with the idea of including the work of other students around me. I don't know what compelled me to do it. I called it "A Collection" and gave copies out to anyone who'd take them. We made a follow-up and I also started making little poetry books. As time passed, a few of us became interested in punk rock (and underground subcultures in general). Living in Pell City, AL in the early 90's, it was difficult to find anything music-related that wasn't country or gospel or bad pop. Evangelist/bullshitter Billy Mayo had come to town earlier and told everyone at churches AND schools that all rock 'n' roll was Satanic. He sold a lot of t-shirts and cassettes. We, of course, were undeterred. Being inquisitive angst-ridden trouble-makers, we researched and found a couple of history-of-popular-music type books in the school library. We were always so frustrated because they were considered reference books and you weren't allowed to check those out. The books featured chapters on punk rock (and/or New Wave), with images of the classics "Punk" magazine and "Sniffin' Glue" typically given a page to share. 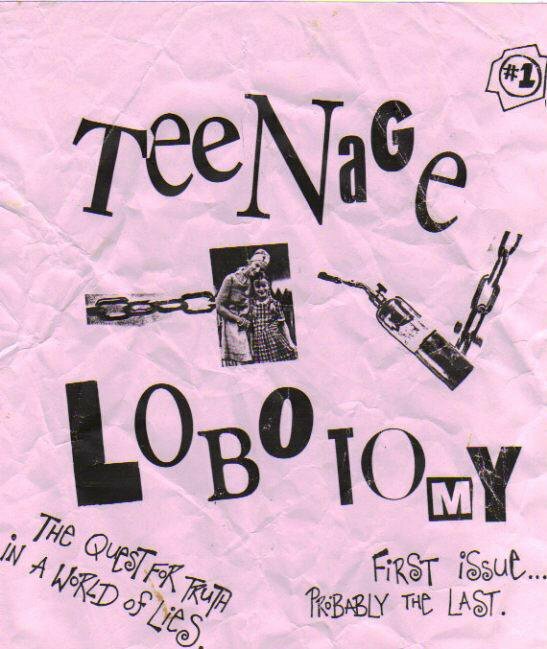 "Punk" being a relatively more "legitimate" magazine aside, these images were massively influential to our bored teenage minds. Somebody had used our no-budget aesthetic to create music papers...fifteen years before us and they did it way better!! Soon, we'd lay our hands on "MAXIMUMROCKNROLL" and "Punk Planet". While newsprint was a little out of our reach, the influence was undeniable. Especially the reviews found within. Around that time, my friend Ivan came across a book that had been donated to a mission with part of the cover cut off. The book in question was Mike Gunderloy's and Cari Goldberg Janice's "The World of Zines". A now-out-of-print guide to zines and zine culture, it is a terrific introduction for novices and an inspiring read for anyone. If ya ever come across a copy, grab it up! Of course, most of the zines featured are long gone, but it's still an entertaining and enlightening read.